Mice pose many dangers when they infest New England homes. Well, it’s officially fall for us Northerners and that means it’s time to pay close attention to any pests that may be lurking near your property and trying to get inside your warm home. Mice and other rodents are among many of the common fall pests affecting homes in New England. And did you know that mice in the house are not only a nuisance but also a potential danger to you and your family? The mouse removal pros at Modern Pest Services would like to share some of the reasons that mice are far more than just a nuisance pest. Mice chew through wallboard, cardboard, wood, and even electrical wiring. Mice gnaw at, tunnel through, and nest in insulation. A female mouse can have as many as 12 babies every three weeks, quickly turning a small infestation into a huge problem. Mice droppings and urine can trigger allergic reactions and spread diseases including Hantavirus. Mice can transport bacteria, such as salmonella, on their bodies and contaminate food sources and kitchen surfaces. Mice can carry in other nuisance pests, such as ticks, fleas, and lice. Sound like a pest you want to be spending the fall and winter in your home? We think not! So to help you prepare your Maine, New Hampshire, or Massachusetts home for the upcoming fall and winter months, click here to refer to our previous blog on how you can pest proof your home to prevent a mouse infestation. Keep in mind New Englanders that these mice can be tricky! Even a tiny opening the size of a dime could lead to a full on rodent infestation. The good news is that the team at Modern is ready to help you effectively get rid of mice in your home. Our Home Care Green program is designed to get rid of any existing infestations and create long-term solutions to prevent future pest problems from arising. 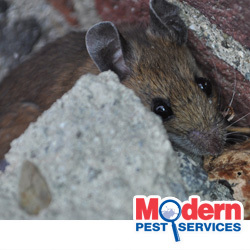 To learn more about pest control for mice and other household pests, please contact Modern Pest Services today!